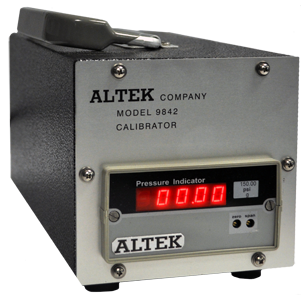 The 9842 Digital Pressure calibrator is used to calibrate the Altek family of Buckle and Panel Testers, including the new 9009 class of testers which display results in tenths of a psig. The 9842 is attached to the calibration port on the unit to be calibrated. Air pressure is applied, and the digital readout on the unit under test is verified against (and adjusted to match, if necessary) the display on the calibrator.